We have found the perfect christmas gift for sleepy heads the Flying Alarm clock. It works on the same lines of the Blowfly Flying Alarm clock whcih makes sure you wake up as at the time of alarm it takes off and flies round the room, making a really annoying noise like a mosquito. The only option to shut it up is to wake up catch the damn thing and place it back on the base. If you do hit the snooze button it will take off once again. In case you are sleeping after a night of partying and dont wake up even with the mosquito buzz then it will fly until it runs out of juice and may end up falling on you. 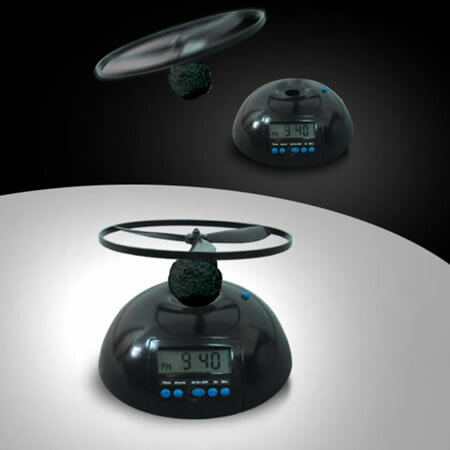 The Flying Alarm clock is available for £19.95 ($ 35). Hi, my name is Terry, I think that is a great alarm clock and would like to purchase one, I live in Canada, are there arrangements available for that? Hi Terry, my name is Berry. Hi…I’m Larry. I always feel merry. Hi Kerry, Merry, Jerry, Berry, Terry, Derry. My name is Harry. My name is Bob. Just Bob. You all are fricking retards. Hi kerry, Merry, Jerry, Berry, Terry and Derry. My name is Bob. Hi Kerry, Merry, Jerry, Berry, Terry and Derry! My name is Rasmus. Hi Derry, kerry, Merry, Jerry, Berry, and Terry. My name is Perry. Hey Kerry, Merry, Jerry, Berry, Terry, and Derry. Does this thing work.- Larry. what a bunch of fairies! Hi Kerry, Jerry, Berry, Terry, my name is Larry. Hope you all are feelin’ a bit Merry! My names just Tod. I feel pretty inadequate. But I do like the look of this clock! Hi fellas, I m Teddy, hw come no 1 invited me to the get2gether? m feelin so upset already, nt talking with jerry, berry, thot u were my fds. Hi Terry, Berry, Jerry, Merry, Kerry, Derry, Larry, Harry, Cherry, and Perry. My name is Gary. Oh and hi Bob. and all the way from Holland …it`s : Barry !! While I love all of your rhymes, I thought I would try helping out the people trying to find this alarm clock. I got it at http://www.dormbuys.com for $25.00. Shipping was a couple of bucks. Here is a link http://www.dormbuys.com/index.php?action=item&id=1389. what a bunch of loonies! Alarm clock is good, though. Any supplies to india?